Methodist Healthcare System (MHS) is the largest health care employer in San Antonio and they needed to be differentiated from their competition. The “Committed to careers” campaign features full-sized billboards and non-traditional recruitment media, radio, television, outdoor, direct mail and the Internet. 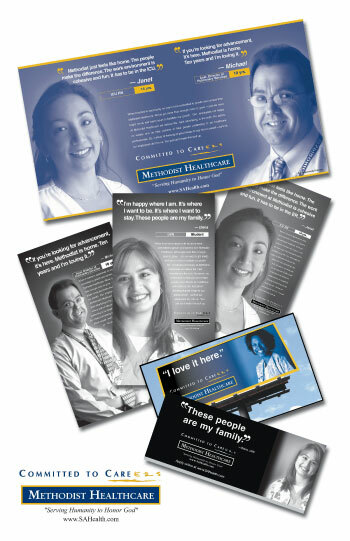 We conducted 30 personal interviews with individuals from different departments and career levels to create a testimonial campaign featuring real MHS employees.